A Slightly Artistic Woman: Festival of Quilts, Wooden House Workshops, and some sketchbook work. Festival of Quilts, Wooden House Workshops, and some sketchbook work. Blogging is a strange thing, which is why I keep coming back to it. If you're around for the Festival of Quilts this year, (NEC Birmingham, 10th - 13th August) do pop along and say hello! I shall be there with Laura Kemshall for the entire 4 days in the Through Our Hands Gallery. Linda Kemshall will be popping in too we hope. 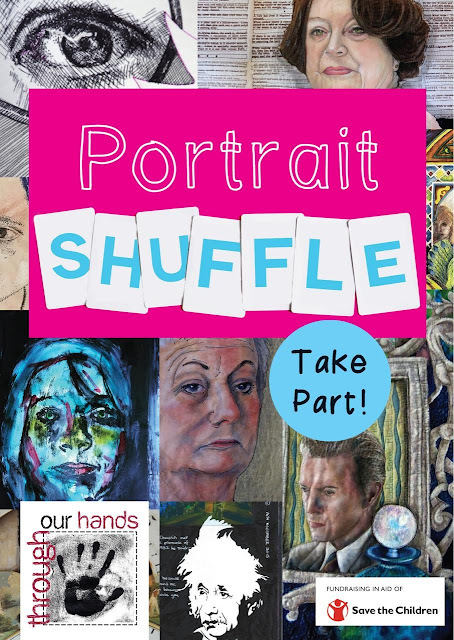 Laura Kemshall and I will be exhibiting very diverse work from most of the 27 TOH Affiliated Artists on the theme of "A Portrait". There were no rules, suggestions or joint discussions about the theme so all the work you see will be very original. My own piece, Self Portrait in the Third Person will be there - I collected it yesterday from Leamington Spa Art Gallery and Museum, and was thrilled to receive the Peoples Choice Award for the Open 2017. Thank you so much to anyone out there who voted. Here's a little video of the making of Self Portrait in the Third Person. You too can have a piece of your own work in our gallery at Festival - which would thrill us skinny! All you have to do is join the Portrait Shuffle and return your work to us before 31st July. It's all being done in aid of Save the Children, who do such incredible work with children all around the world. I have been a bit poorly since March but am much better now, and hope to get back into the swing of more quilts very soon. I've still been pottering of course in sketchbooks, and have visited Laura and Linda Kemshall at the Wooden House for a lovely day of Not Drawing!! (Drawing without a Pencil). Laura is a brilliant teacher and we had an amazing day (and an amazing lunch it has to be said!) She runs her workshops in a newly converted cricket pavillion which is a great space for a small class (no more than about 6 I think) and Laura is very generous with her materials and time. Linda Kemshall was there too of course and it was great to catch up and see her latest and most beautiful watercolour book in person. You can read more about it here. The countryside around the village of Worsley and Bridgenorth where they live is just spectacular too. We did monoprinting, rubbings, tracings, and it was a lovely treat to spend a day with like minded people and just stretch my ideas. Immediately below is a tonal tracing, and underneath that, Laura encourages me to go large and loose with charcoal. Coloured monoprint of a persimmon for a sketchbook page. and finally a bit of therapeutic piecing after a turnout of small bits and bobs from my stash. This is a monoprint through a stencil - link to DMTV on sidebar if you'd like to know how it's done. Inspired by Matisse? No, not really.